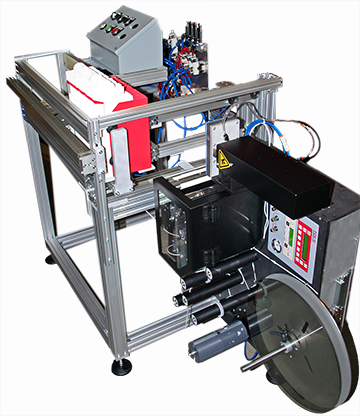 Feeding Systems are useful for pre-labeling cartons, mailers and unfilled bags prior to use. Batches of product can be labeled and collected. Whether every label needs a unique label, such as a mailer, or the same label, FOX IV’s product feeding systems can be configured to meet specific needs. The easiest and best way to label flat product containers like cartons and mailers is with a horizontal feeding system. With this type of system, a stack of cartons/mailers are loaded into a holding device sized for the cartons/mailers. These devices may be adjustable to hold various sizes of product. The carton/mailer is then feed from the bottom beneath the top apply labeler, is labeled and then proceeds to either a shingling conveyor or collection bin. The feeding mechanism can be belt driven or lug driven. These type of feeding systems enable fast, accurate labeling to occur. Another type of feeding system incorporates a vertical feed. Cartons/mailers are loaded in a vertical orientation and pushed forward toward the labeling unit. The carton/mailer are moved in front of the labeler with a robotic vacuum mechanism and the appropriate label is applied. Following label application, the carton/mailer is dropped into a collection bin. 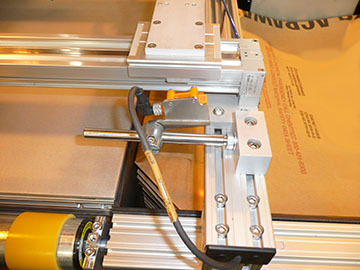 Bag labeling can be done using a robotic vacuum feeding system. The product bags are stacked in a hopper and lifted toward the vacuum arm. The vacuum arm picks up the bag and presents it to the FOX IV labeler. After labeling, the bag is pushed into a collection bin. In general, product feeding systems are a stand alone operation; however, the control and data systems may be integrated with existing databases and information systems.